He is sired by World Champion Get of Sire, Bail Jumper & his dam is Ranger Yet by Texas Ranger. Buckshot is a speckled, gold & bronze coloration with very complete quality type. He has sired some beautiful females with very straight backs & very correct structure. He is much like the famous Measles Super Ranger, yet his horns are slightly longer with much more body size. 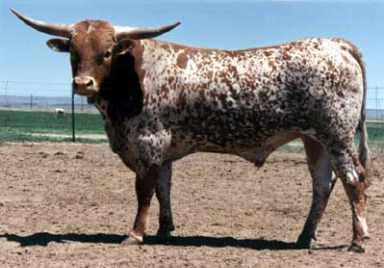 A Buckshot daughter produced Boomerang who was the great horned bull of the TLBAA 2000 show circuit.